Virgin Mobile Reviews - Are They Any Good? Virgin Mobile is of course the brainchild of the brilliant Sir Richard Branson. With presence around the globe, Virgin Mobile teams up with operators in each locale to execute their brand vision. The Virgin brand appeared in Canada in 2005 as a joint 50/50 partnership with BCE Inc. (Bell) however in a short span of only 4 years, BCE Inc. purchased the remaining portion of Virgin Mobile which it didn’t own so by 2009, the Virgin Mobile brand was completed owned by Bell. Bell has continued to operate Virgin Mobile as a separate entity. Virgin Mobile is what we would call a mid-tier mobile carrier and it operates on the Bell Mobility network. Its main competitors are Koodo and Fido and they refer to their customers as not customers but rather members, offering members a wide array of benefits such as special discounts and VIP experiences. Since they operate completely separate from Bell, you will see a strong Virgin Mobile retail presence including both retail stores and kiosks as well as availability in multi-carrier retailers. A number of Virgin Mobile retail stores are what they’ve coined as ‘Service Lounges’ – These stores offer in-person warranty service and can provide you loaner phones if eligible under their warranty service. Below is a broad coverage map of the Virgin Mobile network. As you can see, they already have strong LTE-Advanced coverage in city centres across the nation and we’re sure they’ll continue to invest and strengthen their network. 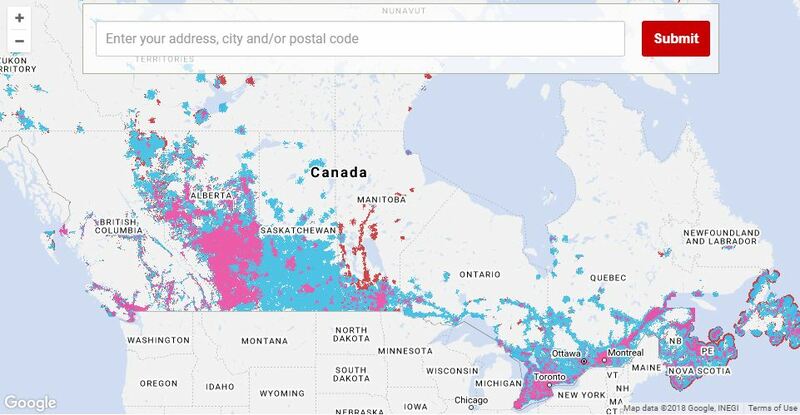 The Virgin Mobile website has an interactive coverage map located here if you’re interested in putting your address in to see exactly what coverage looks like by your home or office and surrounding area. Diamond Plus was introduced as a premium tier plan and while details were not originally available online, we have now added them to the chart below. Please note the below plan prices may vary in Quebec, Manitoba and Saskatchewan. So by choosing Virgin Mobile as your carrier, you get to be a ‘Member’ and receive awesome ‘Member’ benefits. What are these benefits though? So while many of these so called businesses out there offer us ‘benefits’, the things that Virgin Mobile offers to its members are actually things many of us would probably use! They also have a slightly cheaper version of the above that caps your data at 100 MB per day. We suggest going with the above option if you plan to use your data. In addition, they also offer US and International travel passes if you’re looking to pay a flat fee and receive a set amount of talk, text and data. Overall, they have options for pretty much every type of roaming user. Virgin Mobile offers all of the top tier devices from the likes of Apple, Samsung, Google and Huawei and at one point also offered the special iPhone 8 in red! Virgin Mobile also accepts trade-ins of all sorts of devices. If your device is in good, working condition, they pay reasonable amounts for used phones. The device must power on and be functional at a minimum. You can use the calculator on their site located here to get an estimate on what your device is worth! A nifty little offering from Virgin Mobile allows you to pay either $6 per month or $12 per month, depending on your device and the type of coverage you would like to extend your devices warranty. In addition, they also offer coverage for liquid and physical damage as well as for lost or stolen devices. Full details are available here. All in all, Virgin Mobile is a great carrier, winning multiple awards for their stellar customer service. When it comes to plans, we believe the best value is in bringing your own phone. However, that may not always be feasible so it’s important to choose the plan where you get most value. Our side-by-side comparison of their plans above shows you that their $60 per month plan can provide you with 6 GB of data if you bring your own phone, 6 GB if you’re on a Silver plan and no data if you’re on a Gold plan. You need to understand that you pay more for a phone upfront and less monthly or you pay less for a phone upfront and more monthly. Look for the right value and balance in how much you pay upfront and how much you increase your monthly plan by just to have a shiny, new phone. While it’s easy to say lets get a Diamond plan with the largest discount on the device and move forward, keep in mind you’ll be paying that large monthly amount for a long time and someone that choose a BYOP plan is probably paying half the amount you are for the same service. Do I have to sign a contract to get a Virgin Mobile plan? Yes. You must sign a 2 year agreement to use Virgin Mobile services. Does Virgin Mobile offer daily flat fee roaming options to extend the use of your entire plan while travelling? Yes. US costs $7 per day, increasing to $8 per day in December and International costs $12 per day. Does Virgin Mobile do phone trade-ins? Yes. Use the tool on their site here to get an estimate of value for your device. Are you a Virgin Mobile customer? If so, how long have you been with them? Do you agree that their customer service is stellar? Do you believe you’re getting good value for your money with your current plan? Let us know in the comments below! *Disclaimer: We have no affiliation with Virgin Mobile, this is an independent review of their services and offerings.